Have your say – post a comment or share your thoughts…. We were very glad to have a spot to speak at this exciting conference on all things Agile. 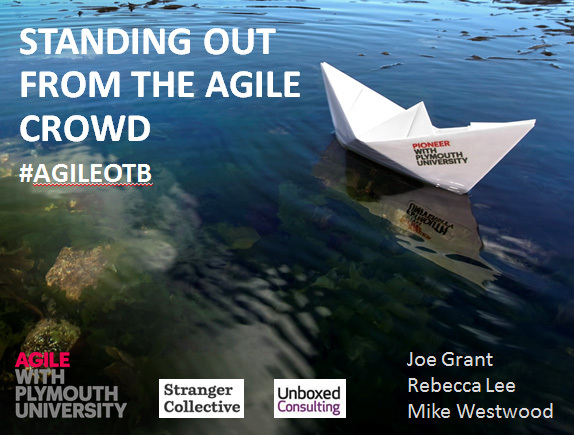 Joe, Mike and I shared the limelight, talking through how we have adopted Agile at Plymouth University, particularly in the website redevelopment project. Agile has worked very effectively for us in this project, and the benefits of working in this way are explained in this presentation. They didn’t tell us the camera was fixed, so you can’t see us all the time! 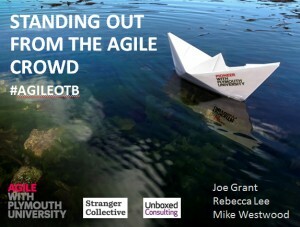 However, you can hear our talk and see the slides in our presentation video, Standing out from the Agile crowd. We got some great feedback and it was very interesting to see how others are using this approach to build exciting and diverse products. Great to hear how things have been going and the successes you’ve been having. Always keen for people to get out and share their stories to help others. Thanks Glenn! And thanks for your invaluable support at the start of the project – we’ve learned a lot! Copyright © 2019 Plymouth University Website Project. All Rights Reserved. Magazine Basic created by c.bavota.